You are currently browsing the category archive for the ‘campus’ category. Ahem. A short journey over to Nuneaton today for the Army event at Gamecock Barracks. The mix of housing, army buildings and open land means that some good courses can be planned there that keep you thinking. And the planner, John Middler, pulled off a bit of a coup by getting a load of us (including me!) to mispunch. I ran the Green course (5.1 km). 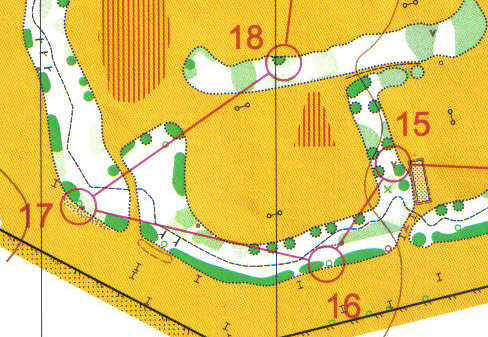 I came out from #16 along the path through the trees and checked the next control code as I ran along. I entered the next section of wood and saw my control ahead. I punched and ran off towards #18, shrugging off the strange feeling that the 6 should’ve been a 4, or was it vice versa? It turned out that I hadn’t punched my control (code 106) at all – I’d punched control 134, on the other side of the thicket. Ian, who finished just after me but on the Blue course, made exactly the opposite mistake! And we were far from the only ones to fall into John’s trap. So, what went wrong? Well, on both courses this control was towards the end of the run, so we were getting tired, both physically and mentally. Also, I think your concentration tends to drop anyway towards the end of a race: everything has been straightforward so far, we haven’t seen any controls anywhere that weren’t ours, we’ve been checking the codes but we didn’t really need to, and so on. So, kudos to Mr Middler for one of the most brilliant traps that’s ever been sprung at an orienteering event!